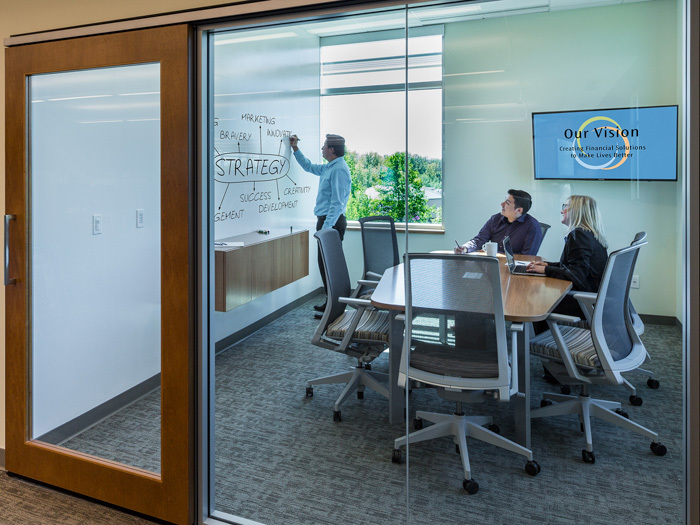 3Rivers Federal Credit Union’s decision to pursue a transformational workplace was rooted in a quest for organizational nimbleness. They needed innovation from a more agile and collaborative team, and they knew a better headquarters environment could support this innovation. The credit union’s leadership team dubbed it “A place to think and do things differently,” and the quest was designated as a multi-year priority for the credit union. When they took on the project, they knew that success of such substantial workplace changes would hinge on the appropriateness of the design, along with understanding and acceptance of the changes by the broader employee team. They knew their initiative needed a formal change management strategy. According to the Harvard Business Review, three-quarters of all organizational change initiatives fail, either forgotten for other new, high-priority objectives, or because they never deliver the intended benefits. The workplace projects taken on by financial institutions are almost always so transformational that they assume the quality and importance of a formal organizational change. They are more than the event of moving from an outdated office space in to a newer one. Modern workplace transformations reflect a years-long shift in organizational thinking towards more distributed decision making, greater reliance on teams, and increased flexibility in choice around one’s optimal work setting. The process and work required to adopt and benefit from changes in the workplace must be carefully planned and delivered over time. A formal change management strategy will do precisely this. Change Management is a systematic process that an organization adopts to address stakeholder resistance to change and increase the likelihood for quick adoption and success. In life, the unfamiliar and uncertain are naturally met with a degree of curiosity and a large measure of resistance. Change management strategies therefore rely heavily on communicating the intent for proposed changes, as well as the anticipated benefits and team member impacts. They also work best when they achieve stakeholder buy-in through participation in development of the workplace transformation strategy itself. Workplace Change Management strategies do not need to be complex, rather they require charismatic sponsorship by leadership team members, consistent communication, and tools to support employees in their transition to their new environment. Gain team member buy-in by including broad sections of the employee team throughout the strategy, design, and implementation process. Start with a survey designed to gather feedback on important work activities and focus on the workplace settings and tools that will best support this work to help the strategy grow from the ground up rather than from the top down. Also provide educational opportunities for employee teams to learn more about the options and benefits of their transformed workplace. One excellent way to do this is to tour teams through other transformed workplace settings and have them talk with peers who have experienced the spaces in their own daily work. Other useful tactics for buy-in include setting up furniture mock-ups for proposed workstations, touring office furniture showrooms, and holding round-table discussions. Document the mission for the workplace transformation. This “Big Idea” is captured in a charter statement that can be shared consistently with the team and will help take uncertainty out of the change. This charter statement will make the business purpose of the change clear and underscore the benefits of the proposed changes. One helpful step in developing a project charter statement is to brainstorm a list of ways success of the workplace changes can be measured upon project completion. Success should be measured from the perspective of individual workers, employee teams, and the overall organization. While the institution’s leadership team will have a quest for the workplace change project defined at the project outset, the charter statement should be formalized after gathering employee team input gained during the survey process. Create a communication plan and execute it over time. Starting with the project charter statement, the intent and proposed changes and benefits of the change should be communicated to the entire team clearly, openly, and consistently. A formal communication plan will address the timing of communications, and will ensure teams are up-to-date on project status and are given an advance opportunity to learn more about the proposed changes. Again, this careful communication will help eliminate uncertainty and unfamiliarity from the change event. Communications can be via emailed newsletters, but can also come through interim town-hall presentations, fixed displays, and more informal cascading communications sent down through organizational divisions. One potentially powerful communication tool is a move-in day handbook that helps employees learn how to use their new workplace quickly. At a higher level, communications will help employees understand that as they may trade away some of the personal work spaces they have become used to (or even feel entitled to) they are gaining more flexibility in their ways of working, and more ample spaces to work together with others – and that the net result is an overall benefit to themselves and the entire organization. Build enthusiasm to make the change. This starts by identifying a project sponsor at the leadership team level. A high-level sponsor signals the importance of the project, and will be able to speak authentically to benefits of the proposed change – the goal being to help people want to make it. The project sponsor should find and nurture what MIT’s Alex Pentland calls “Charismatic Connectors”. These are team members at all levels of the organization who communicate eagerly with a large number of coworkers and are demonstrated early adopters of past organizational change. The project sponsor will benefit from involving these charismatic connectors in project planning, getting their feedback, and recruiting them to share what they’ve learned with others in the organization. 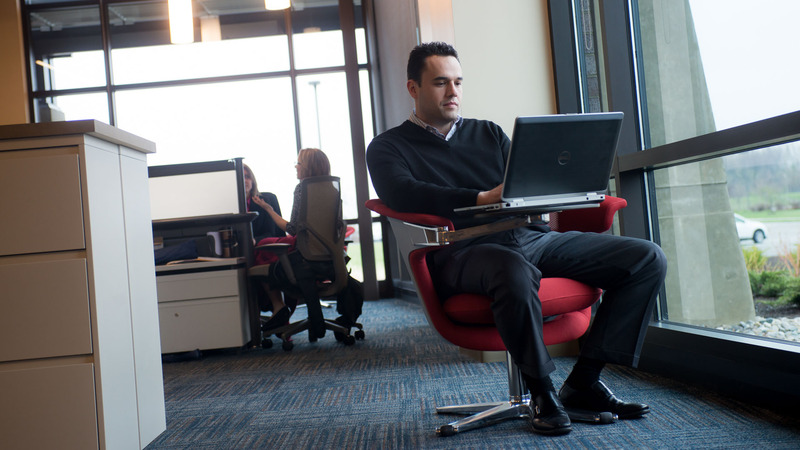 Develop a user’s manual to support the enduring success of the new workspaces. What is important at this step is to ensure both management and the employee team understand the intended purpose of potentially unfamiliar work settings, and how to use them effectively. This is particularly important for more informal settings such as a company café or lounge areas where untethered work is permitted. New procedures around conference room reservations, technology procurement, or employee owned devices should be laid out. Establishing workplace etiquette expectations is important here as well. Ways to deal with noise, confidential conversations, keeping from distracting others, and even food odors can be defined clearly, helping minimize future areas of contention. Support the move through training, preparation, rapid resolution, and demonstrations. If employees encounter few hitches on move day they will be able to get back to work more quickly and therefore have more positive thoughts associated with the change. Advanced training, supported by the user’s manual will ensure employees know what to expect out of their new environment. Having a team set up to field and respond to any problem that arises out of the move can convey another positive experience, and will again, help employees get back to work more quickly. 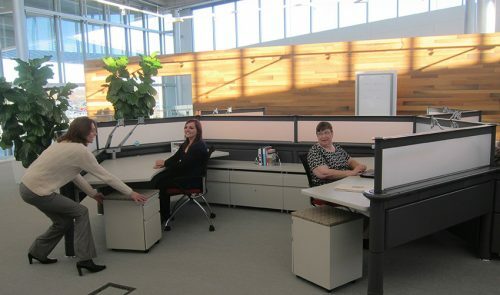 One critical element of supporting the move is having leadership team members and managers immediately begin to use the communal and non-traditional workspaces in the course of their everyday work. This will create a clear impression that all team members have permission to work away from their designated workstation. Perform a lessons-learned evaluation of the workplace change 90 days to 6 months after the move. This is an opportunity to evaluate progress towards the goals identified in the workplace change strategy, and it’s another way to make the change process more transparent by reporting on this progress to the entire team. At this point, it’s appropriate to evaluate the current use of the various workspaces and determine if any policies and procedures around their uses need to be reinforced, or if perhaps they should be adjusted. Over the longer term, an annual reflection and adjustment process will help workers use their new office setting more effectively and make the benefits of the workplace change more durable. 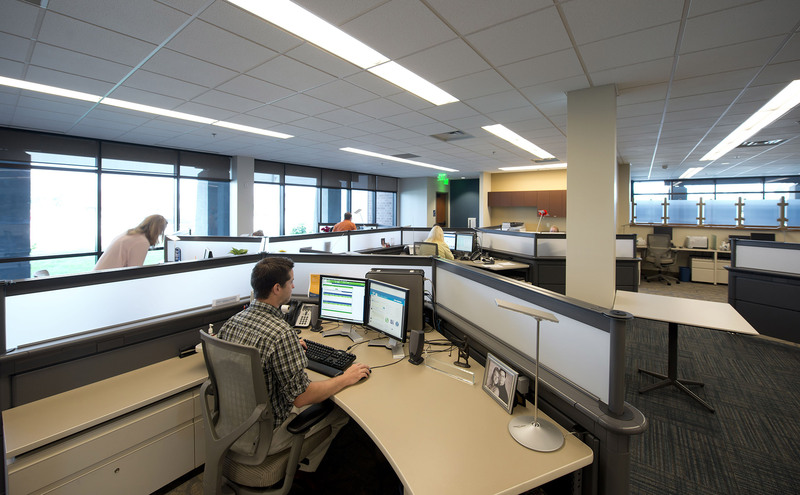 Now, five years after settling in to their new headquarters building, the 3Rivers team is able to reflect upon improved metrics such as membership growth, internal project delivery speed, and success in employee recruitment. Their home office, designed to support more innovative thinking and better team collaboration, continues to support their quest. 3Rivers’ transformational workplace has been successful and endured in large part because of the careful change management strategy the credit union’s leadership team undertook. From building a team of charismatic connectors and taking them on a road trip to Haworth Furniture’s world-class headquarters, to having a CEO who continues to work from his laptop in the employee café every morning, the 3Rivers change management strategy relied on a diverse range of team members to communicate and demonstrate the proposed changes and benefits planned in their workplace transformation. Financial institution leaders looking to benefit from enduring change in their home office will find success more easily reached by instituting a Workplace Change Management strategy that removes the unfamiliar and unknown from the experience and replaces it with a clear understanding of the benefits to be found in a transformed headquarters office.